An USA airstrike has killed more than 150 al-Shabab militants in Somalia, the Pentagon said on Monday 03/07/2016 evening. Spokesman Captain Jeff Davis said the strike hit a training camp where a “large-scale” attack was being planned. “Initial assessments are that more than 150 terrorist fighters were eliminated,” he added. 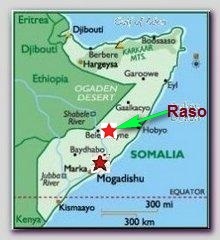 Mr Davis said the strike, by both drones and manned aircraft, took place on Saturday 03/05/2016, and targeted Raso Camp, a training facility about 120 miles (195km) north of the capital, Mogadishu. “There was a sense that the operational phase was about to happen,” Jeff Davis said. Also on Monday, the Australia said its navy had seized a huge cache of weapons on a fishing boat off the coast of Oman that was apparently heading for Somalia. Grenade launchers, machine guns, and 2,000 assault rifles were concealed under fishing nets, a Navy spokesman said. ** On 01/15/2016 al-Shabab raided a Kenyan base in el-Ade, Southern Somalia, that Somalia’s president said killed at least 180 soldiers. The American airstrike is, probably, a response in support for Kenya and other African Union forces in Somalia .